Welcome to IKAKA - the sensible choice for landlords and others requiring large quantities of furniture at a price that's right. In the past, we have often been confused with a certain Swedish furniture company. However whilst we both offer furniture at competitive prices, we at IKAKA appreciate that there are occasions where quantity over quality is a desirable. As a result we pride ourselves on being able to deliver tenant-quality, token furniture for use in "furnished" properties. Our highly trained quality-control team inspect all furniture before dispatch to ensure no items of real quality are accidentally installed in your properties for use by your tenants. IKAKA appreciates how difficult it can be squeezing any money from your ungrateful tenants. To assist you we have several time and money saving schemes. Our most popular scheme is the "by weight" where you may simply order multiple furnishings by weight. 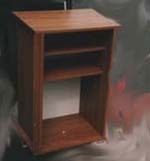 We will deliver the furniture free of charge and dump it in which ever property you wish. In every by weight package will be a selection of furnishings varied enough for you to declare the property "furnished"
Here is just a small sample of some of the comments we received from our happy customers, with almost no money changing hands. "I used to spend hours trawling through rubbish tips and peoples dustbins indiscriminately collecting random pieces of crap furniture for my properties until I discovered IKAKA. Now I leave the donkey work to them and sit back and count my cash." "Until I discovered IKAKA making a property I'd bought for a song legally rentable was a nightmare. Now I have to invest even less time on coining-in from my scummy tenants." 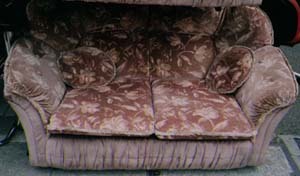 "My tenants used to end up with furniture that I could've got a few quid for at a boot sale. I was literally losing pounds every year. Now, thanks to the professionals at IKAKA I can sleep soundly knowing that any funriture at my rented properties is completely worthless and yet still allows me to grab a couple of extra bob every month for having a furnished flat." A best seller! 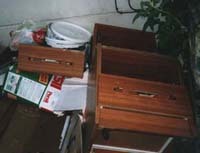 Your choice of broken or missing drawer. Optional feature: time release scratches - a guarantee that you can take some of your tenants' deposit money. This low cost item may be legally be referred to as a bed in Estate Agents' blurb, making it an essential item for the Rigsbyesque bedsit. Despite this noble title, the LuxoWobble provides the maximum in discomfort coupled with an astonishing disregard for craftmanship. Every LuxoWobble bed has a 6 month Guarantee of failure - your money back if it isnt in pieces by the time your tenants are due to receive their security deposit. 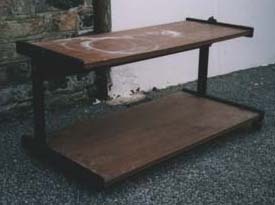 Is it a table? Is it a shelf? Whatever it is, it's completely knackered! What rented property would be complete without a thoroughly bizarre and useless object such as The Albatross ? We guarantee that not only will your tenants be unable to identify this piece, but also that it will continually get in their way throughout their tenancy. Impossible to store, impossible to hide, this is one item you won't want to be without. A paragon of late 1970s design, this almost adequate setee will be sure to give even the fittest people spinal damage. Every inch of the garish fabric shields a spike, point or lump capable of ruining anyone's evening at home.